One of the wonderful things about Ravelry is the ability to see what other people do with the same materials you have, and draw inspiration from that. 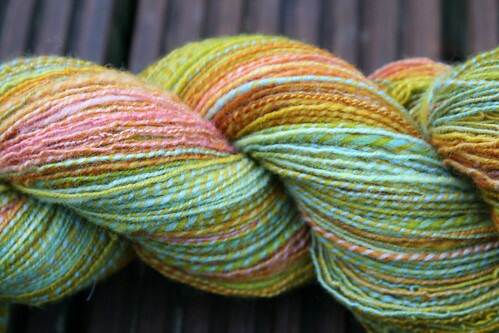 The Hello Yarn Fiber Club - Finished Yarns thread made me realize that this fiber (which I somehow neglected to ever photograph - woops!) needed to be a two ply. And soon! I started spinning the week before we left for France, and managed to fill up one bobbin and get through half of the second before we had to leave. 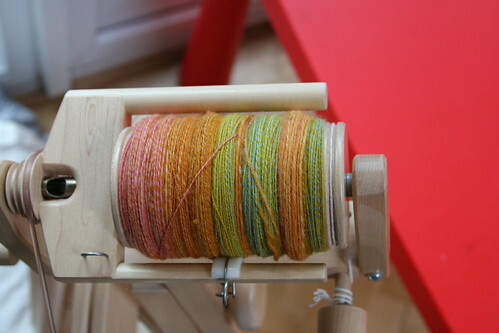 Finished up the last of it the two days after we got back and immediately plied. Despite what it looks like in that picture, the bobbins did not end up matching all that well when I was done. Plying took a couple of nights, and it was done. 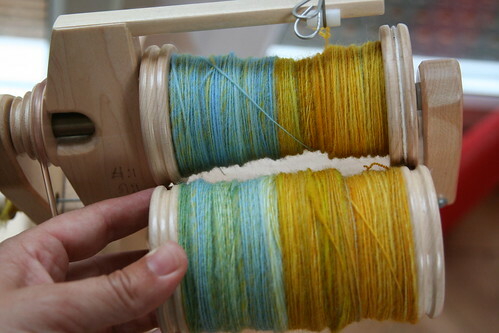 I split the 4 oz in half and spun/plied at 12:1, double drafting from the fold. No attempt was made to match up the colors but they ended up melding really nicely. For whatever reason I was bound and determined to get the entire 4+ oz on to one bobbin. 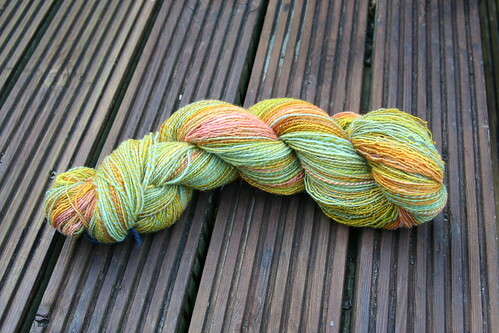 And I had dramatic evidence of the difference between woolen and worsted spinning styles. That's approximately the same amount of fiber (~4 oz), one spun worsted and navajo plied, one spun semi-woolen and 2-plied. I'm amazed my wheel didn't give me the finger and go on strike. Final stats: 4.3 ox/121 gr, 500 yds, 14-18 wpi. Somewhat overplied (or underspun - I had trouble with singles drifting apart) in spots but not too bad. Finished with a hot/cold fulling wash.
And almost enough for a large Aestlight. The problem with that however will be addressed next week (otherwise known as bribing myself to finish some UFOs before I cast on anything new!). Written by porpoise On August 7, 2009 In "FO", "fiber club", "spinning"